Unprecedented Price Reduction if sold in 60 days! "Magnificent and breathtaking" are only a few of the words describing this âTop Of The Worldâ mountain retreat. The SECLUDED & prestigious gated community of Riva Chase make this a rare, masterpiece where construction cost far exceeds the current price. A home that was built to last a lifetime, a structure of permanence while the free-flowing interior with VAULTED, soaring ceilings & walls of windows illustrate all the qualities of a modern lifestyle. Updates have been made & you need to see it now. 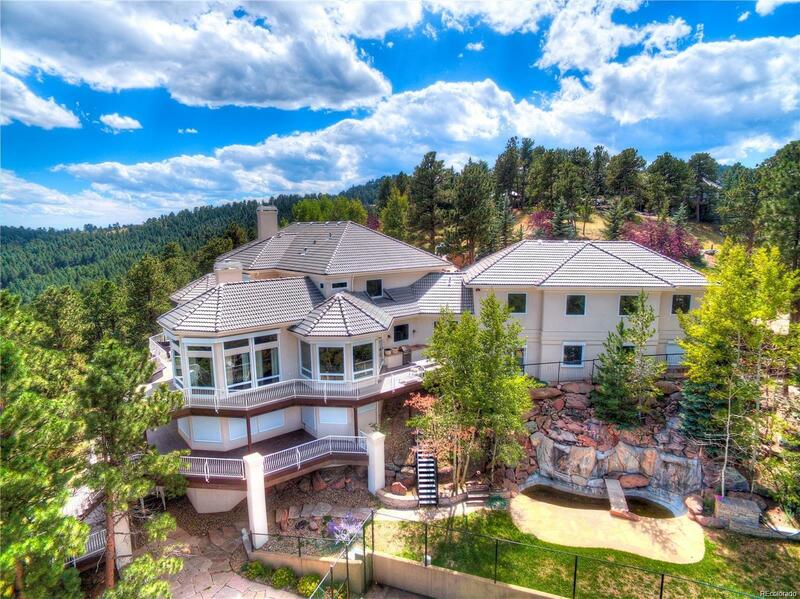 A wooded 4.15 acre lot, is perched on the âRIDGEâ so that panoramic views over Denver, I-70 & Mother Cabrini Shrine are the backdrops from every room (breathtaking) yet your PRIVACY PREVAILS! Peter Forsberg, (NHL professional) lived here and his stamp is all over the amenities which include a lighted pickleball/bball court, sand volleyball court waterfalls, & a FURNISHED gym (over 1000 sq ft). Multiple patios, decks, gardens & stone paths.